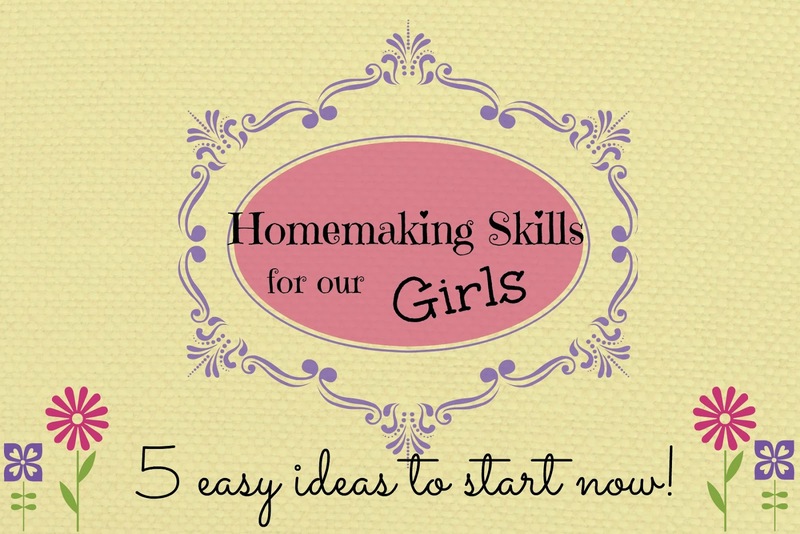 Entrusted Heritage: Homemaking Skills for our Girls (III) - 5 Easy ways to get started! takes determination. We have to create consistent opportunities to train and allow our girls practice. Keep in mind we're not simply trying to arrive at a goal. The focus should be the discipleship opportunities along the way. We will see opportunities to encourage, to pray for our daughters, to correct, to train, and to have fun together. These can be some of the most memorable times together. It really can be so much fun! Meal Helper. Determine a day of the week in which your daughter is your meal helper. Depending on her age and skills, she may be able to wash vegetables, chop things, season things or stir. Teach her the basics of making certain dishes...learning to make white sauce, gravy, soup from scratch, bone broth, yogurt, etc. Every week, on that day, she should be ready to help and learn. After a few weeks and some progress, give her a little recipe box and some cards she can begin to use and save for her own treasure chest. She will beam! She will feel so important! And please don't give into the temptation to decorate her box or to organize it for her. Let her do it herself. If her writing is too big for a small card size, you could give her a bigger box! You could give her a few recipes cards to begin with...the ones she is learning to do really well. My mom used to send my children those little grocery store recipe cards. Some of the recipes were to complicated for their age or skill level but it made them feel special and they could always choose to save them in their recipe box to try later. Example: My 5 year old is learning to make our homemade ranch dressing. She will be in charge of making it once she learns how to read the card (you can use picture recipe cards too) and can be trusted with the ingredients. This will be one of the cards I give her when she gets her recipe card box. Chore: Give your daughter (and each child) a specific chore she does before and after EACH meal. Consistency is the key. Have a job (or two, or three) that she does every day at mealtime. In 6 months, add another responsibility or swap jobs with other siblings. Having to do the job over and over may get old but this is an opportunity to build character. Example: One of my younger daughters helps get waters ready for every meal. This is her first year to have that responsibility. My 11 year old daughter oversees two younger sisters as they dry and put up dishes - kind of like a team leader. We're all a team working together to clean the kitchen after each meal but she specifically is responsible that the after-meal (kitchen) cleanup gets done (we use a checklist). Everyone knows their task (including my son). Assign a Weekly Task (beyond chores): Decide on a specific baking/cooking task for your daughter to accomplish each week on a certain day. Again, depending on her age and skill level, this may require more or less help from you. Once you determine she can handle the responsibility, give that job to her. Tell her that if she doesn't do it, it won't get done. It is good for the children to have real responsibilities that help the family. I am talking about things beyond making beds and brushing their teeth. These are good but we need to move beyond those as time goes by. Example: My 11 year old is slowly taking over the bread making and baking responsibilities. Sure, she still has direction from me and we talk over the recipes she might be using but, she is in charge of planning what she needs every week and writing it on our master grocery shopping list. She has to make the calculations for when the bread will be done (for a meal, for breakfast, for a gift, etc). 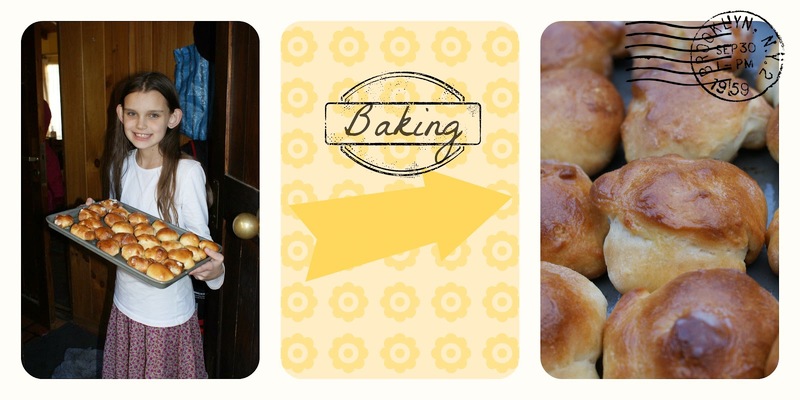 BTW, bread making is a great way to put those math skills into practice! Skill Building: What about another skill?...sewing for example! Begin to teach your daughter to embroider. You can start small and simple...just use a plastic needle or a large dull needle and a hoop with fabric that the needle can go through. Let them make their own design...don't make them follow a picture at the beginning. Make it fun and encouraging. Some people like to start with the lacing boards but I like to move on quickly to 'real' sewing. Frame their masterpiece and show it to everyone in the family. Move on to another hand sewing task...something else to embroider or sew. My youngest daughers have made little baby doll pillows and bookmarks. I give them scraps of material and let them design and create clothes for their baby dolls while I sew. When they are really young, I help them sew it up. Once it is done, I give them all the praise and we show it to the family. By letting them get a taste of what it is like to do REAL tasks, you are building an appetite in them. This isn't just play (although it is really fun). Later, we start a simple project that I can help them with like a pillowcase or a skirt. They will need lots of help at the beginning but eventually will gain confidence and skill if you keep at it. The absolute #1 piece of advice (something my own Mom did in my life) is: DO A LOT OF ENCOURAGING!! It doesn't have to be perfect. It has to be theirs and they have to enjoy the process or they won't want to do it again. Don't let your mind wander to the dollar and cents or to the workmanship quality. Those things will come with time. At the beginning of learning the skill, pour into them and encourage a lot. USE THE SKILL: Decide on an occasion where you daughter can use her skills to bless others. Is there something this week? A family or individual who would be touched by a special gift? For example, there might be a special birthday coming up and you ask your daughter to make (or help make) a gift for that person. This can be sewn, baked, or even something easy like a cookie mix in a jar! This is great for the real little girls. The focus is investing in your daughter and how God can use her gift to bless someone else. As mothers, this will require humility on our part because we have to give up our desire to give the prettiest gift or the most creative gift. Those of us who like to craft might have to give up some of our own expectations and let our daughters' newly developing skills shine. It is worth it! It really can be so much fun! The possibilities are endless! Your main obstacle will be time. If you don't PLAN on how you will make this happen, it just won't happen. If you are not walking alongside your children and spending time each day with them, these opportunities will be harder to come by. It has to be consistent. This is modeling the reality of life. Now, lastly, can I just be honest here? I am still a work in progress as a mother. What I am sharing is simply what the Lord has taught us and led Eric and I to do over the years. We have been blessed to learn many of these things from other families so we cannot take the credit. God gets all the credit! We see the blessing of His work in our daughters. It goes beyond skill teaching, of course! It is about discipleship and leading our entrusted ones to the Lord Jesus Christ in ALL areas. I love the ideas you share here. I'm really trying to teach my children homemaking skills and appreciate your practical tips! Thank you, Gina! I appreciate your encouragement. The best part of teaching our children is that we have a wonderful Teacher ourselves and rely on Him everyday since He knows our children best! God bless you!